The origins of Salisbury Musical Society (the SMS) are closely linked with those of our sister society Salisbury Symphony Orchestra (SSO). While groups of local musicians had undoubtedly joined together to perform, more or less formally, for many years previously, it was in 1917 that (Sir) Walter Alcock, then the Organist of Salisbury Cathedral, suggested the formation of an Orchestral Society that would give concerts with “Dr Alcock’s Oratorio Choir”. 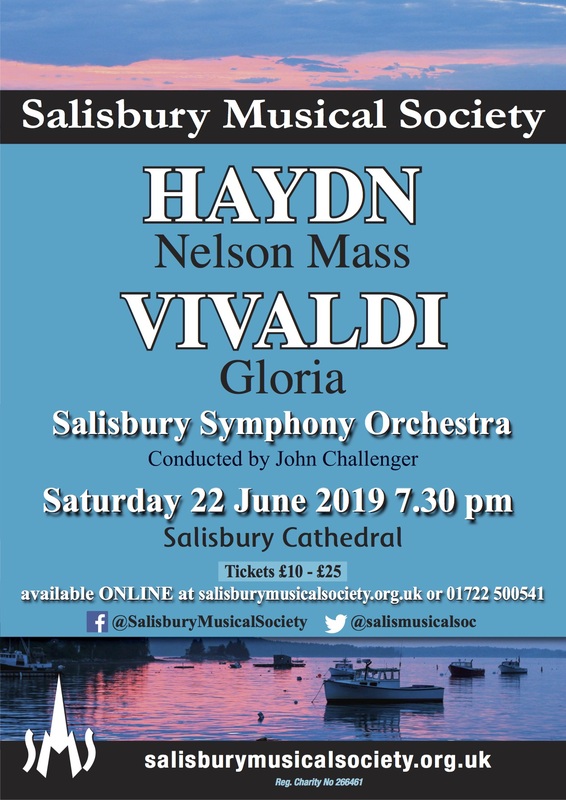 In 1923, after successful performances in the two previous years, the choral and orchestral sections united under the name of Salisbury Musical Society. The first performance was of Brahms’ Requiem, given on Wednesday 5th December 1923 at 2.30 pm. The second choral concert was of Mendelssohn’s Elijah on Wednesday 3rd December 1924, again at 2.30pm. Both these concerts attracted over 3000 people. Later, in 1931, the orchestral players split off under their original name, which in 2003 changed again to become Salisbury Symphony Orchestra. The close link with the Cathedral has been maintained, our Conductor having traditionally been the Director of Music at the Cathedral. The choir now regularly gives three concerts each Season in the Cathedral, two with the Chelsea Opera Group Orchestra and one with SSO. Since its 60th Anniversary in 1983, the Society has performed works by almost 40 different composers, from Monteverdi onwards, and in the past 25 years no work has been repeated in one of our regular concerts within seven years of a previous performance. Whilst our programme has continued to be built around the works of the great choral composers, (for example Bach, Haydn, Mozart and Handel), the 20th century has been well represented by Elgar, Vaughan Williams, Britten, Janáček, Poulenc, John Rutter and Howard Blake, among others. One concert had Leonard Bernstein’s Chichester Psalms paired with Carl Orff’s Carmina Burana. Another combined Tavener with David Fanshawe’s very colourful African Sanctus. In 2009 we brought our repertoire into the 21st century by joining other Salisbury choirs in the world première performance of Salisbury Vespers by the English composer Bob Chilcott. For our 90th Anniversary Season (2013-14) we commissioned a 15 minute work (My God and King) by Jonathan Willcocks, premièred on 14th December 2013. SMS is committed to involving children in its music-making and regularly invites school choirs to take part in its performances. We often use the Cathedral Choristers. Four of the Girls’ Choir sang with us in the Rutter Gloria in December 2010, and we were joined by school choirs for our performances of Berlioz’s Te Deum in December 2009 and Bach’s Mass in B minor in March 2010. Our performances in 2012-13 included children in Rutter’s Mass of the Children and Britten’s Spring Symphony. In July 2011 we introduced our Youth Award Scheme, specifically designed to encourage younger people to join the choir. SMS’s other principal connection has been with the Philharmonische Chor, Berlin. In 1989 we provided 26 singers to sing with them in an international choir to mark the 50th Anniversary of the outbreak of the Second World War. In 2000, to mark the Millennium, we performed Verdi’s Requiem together, twice at the Philharmonie in Berlin and then in the UK at St Paul’s and Salisbury Cathedrals. In 2008 we joined them again to perform Elgar’s The Dream of Gerontius, in Berlin and in Salisbury, marking the 750th Anniversary of the Consecration of the Cathedral. In April 2011 we performed Beethoven’s Missa Solemnis with the Portsmouth Choral Union in both Salisbury and Portsmouth. And in 2016 we performed Verdi’s Requiem in Salisbury and Guildford with Guildford Choral Society. The financial demands placed on the SMS have changed over the years. In 1972/73 the Diamond Jubilee programme noted with awe the increase in the costs of putting on concerts. Brahms’ Requiem in 1931 had cost just £48:17:1d (about £48.85) to perform and Janet Baker had sung Gerontius in 1960 for a fee of 18 guineas! Concerts today regularly cost over £10,000, more than two hundred times the 1931 price and a soloist for Gerontius might now receive fifty times Dame Janet’s 1960 fee. SMS decided in the 1980s that it could no longer rely on funding from local authorities and regional arts associations and has for many years now been independent of them. It is grateful to the various sponsors for their help and for the generosity of Patrons and its own members for its current financial independence.